Last summer, my husband and I decided to retrace the route we had once taken to the Canadian border. Ten years ago, our son was a young hockey player and we were driving him from our home in New York to a tournament in Québec City. This time there were only two of us in a sedate sedan, rather than three in an SUV stuffed with smelly athletic equipment. The back seat felt empty. Andrew was 13 when he was chosen as a goalie on one of 108 teams of 13- and 14-year-olds from 12 countries competing in the annual Journoi International de Hockey Pee-Wee de Québec, the world championship of pee-wee hockey. After driving more than 500 miles, we spotted the distinctive green copper roof of the sprawling Château Frontenac hotel and realized we had reached our destination. For 52 consecutive years, the peewee tournament has been held at the Colisée Pepsi, coinciding with Carnaval de Québec, the largest winter carnival in the world. February is the coldest month of the year in Québec, with temperatures averaging in the single digits. The huge mounds of snow are measured in feet, not inches, and gusty winds coming off the St. Lawrence River add to the chill. Some say festivities such as this help the Quebecois make it through until spring. We traveled by car between a series of chilly ice rinks spread across suburbs with names such as Val-Belair and Charlesbourg. Before morning exhibition games, the team stopped at Tim Hortons for hot chocolate and fresh doughnuts or Canadian toast. During down time, the boys were smitten by winter carnival traditions such as dog- sled and canoe races, night parades, the ice palace built at the Place de l’Assemblée-Nationale, and the appearance of the beloved, oversized mascot snowman called Bonhomme. They were dazzled by the whimsical Snow Sculpture Show on the Plains of Abraham and were excited to go snow tubing at the Valcartier Snow Park outside the city. Back at the hotel, the boys ran off to the nearby bobsled run whenever they could and played pick-up hockey outdoors after dark on the illuminated ice rink beside the hotel. In the meantime, their fatigued parents retreated to the cozy Bar Saint Laurent & Lounge for beer, wine, and hockey talk. The most thrilling moments, of course, were watching the team play a single-elimination game in front of more than 27,000 hockey fanatics. The team lost, 3-2, to a home team from Beaubourg. When the boys returned to the ice in a line to shake hands, tears welled up in my eyes. Andrew, now 23, has graduated from college, and is working as a software engineer and living in Manhattan. He never became a hockey pro (although one boy on his team did). Since he is an only child, the house often feels empty and quiet. Approaching the imposing Château Frontenac a second time on the narrow Rue Saint Louis evoked a rush of memories. Instead of the ground being blanketed with snow, colorful summer flowers cascaded from window boxes. Taken over by Fairmont in 2006, the hotel once owned by the Canadian Pacific Railway had been tastefully refreshed. The comfortable corner room we were assigned had a beautiful view of the river on one side; on the other, we were entertained by a revolving cast of street performers on the plaza beneath us. With time and summer weather on our side, we walked the cobblestone streets until our soles wore thin and saw Old Québec in a different way. We explored the architectural, historical, and cultural offerings of the only walled city in North America, and walked along paths through the Plains of Abraham, the great lawn of the city as Central Park is to New York. We dined at a mix of trendy cafes and more elegant restaurants. Behind the hotel, we took the funicular down to the winding streets of the Lower Town and browsed leisurely through art galleries and quirky shops. We stopped at Place Royale to watch historical reenactments. Then we took a ferry across the St. Lawrence to Vieux-Levis, a hilly city on the southern shore. One evening, we went to the dock near the Old Port Market to see the world’s largest multi-media experience of film and images. Projected on huge grain silos equivalent in size to 25 IMAX screens, the Image Mill brings 400 years of Québec history to life. Our visit coincided with La Fête nationale du Québec, a national holiday celebrating Saint-Jean-Baptiste Day. Thousands of boisterous young people marched through the streets with blue and white flags as they headed to festivities on the Plains of Abraham that culminated in a bonfire and fireworks. For just a moment I wished Andrew and the team were there with us. On our last evening, we re turned to the Bar Saint-Laurent & Lounge. Sipping cocktails and watching the sunset, we felt the joie de vivre of Québec, and fell in love all over again during this different season. I’ve always wanted to go to Quebec City, but never thought of driving there. When is “La Fête nationale du Québec, a national holiday celebrating Saint-Jean-Baptiste Day”? Sounds like a great time to go there. Quebec City is so lovely and your post brings back memories for me — of being 16 and visiting there with a few friends from my French class. I felt like I was in Paris (not having been to Paris at the time) — it was so beautiful and romantic. I’d love to go back now with my husband and take in the scenes as you did. I agree that Quebec still feels like the next best thing to Paris! 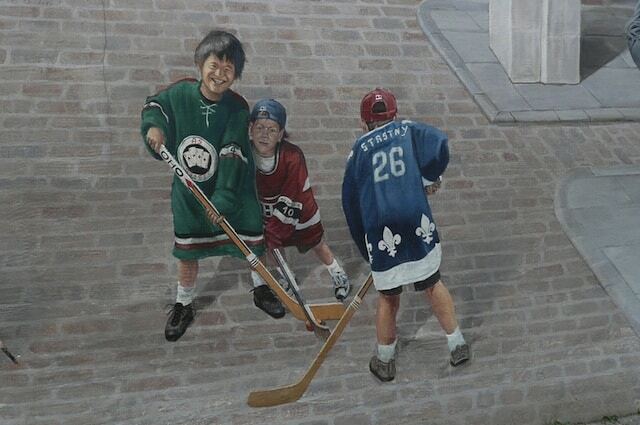 Our visit to Quebec City also had to do with our children — sort of. Although we live in Philadelphia, our sons ended up attending a summer camp just south of the Canadian border below Montreal. (I was a busy lawyer Mom, so we sent them to a camp vetted by one of their friend’s mothers. She seemed like a responsible person who wouldn’t want to be sending her child to a bad place). We decided to tack a Canadian road trip onto the camp parents’ visiting day, so we visited Montreal and took a day tour to Quebec City. (BTW, the camp turned out to be fine — except for the meningitis outbreak). No hockey memories- our son was in about every sport but that. I do have some treasured Chateau Frontenac memories. What a grand-dame! We’ve only been to Vancouver and BC – we look forward to someday exploring more of Canada. Sounds like you picked a great time to re-visit Quebec City. 🙂 I’ve been there several times and just love it, ( in summer; went once in the winter and wouldn’t want to do that again – too cold for me. The Carnaval must have been lots of fun though.) It reminds me so much of Europe, where I used to live. A beautiful, historic city! Quebec is the next best thing to France. I think that everyone loves Québec!